At TaG-Team agility Group we teach classes, clinics and host trials throughout the year. TaG is owned and operated by Glenn Tiede. TaG operates in Comox Valley, B.C. Classes are very small with there being 6 dogs per 2 teachers for 60minutes. Competitive and noncompetitve classes are available. Classes start at the beginning of each month and run for 4 weeks. Glenn has over 17 years experience working with dogs. 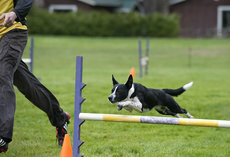 Agility is a great way to get out and play with your dog. It builds confidence and creates a wonderful bond between dog and handler. TaG teaches all ages of handlers and all breeds of dogs. Classes are taught in a fun learning environment with the dogs health and well-being its' #1 concern. Be warned.....it is highly addictive. Also check TaG out on Facebook.